The mobile revolution is upon us, yet it’s clear that we’ve only seen the tip of the iceberg. We’re heading towards a world where nearly every device is connected, with no search boxes and no browsers. Machine learning and voice search are becoming an increasing part of the landscape that’s making this possible. But what does this mean for businesses today? How can you benefit this year? 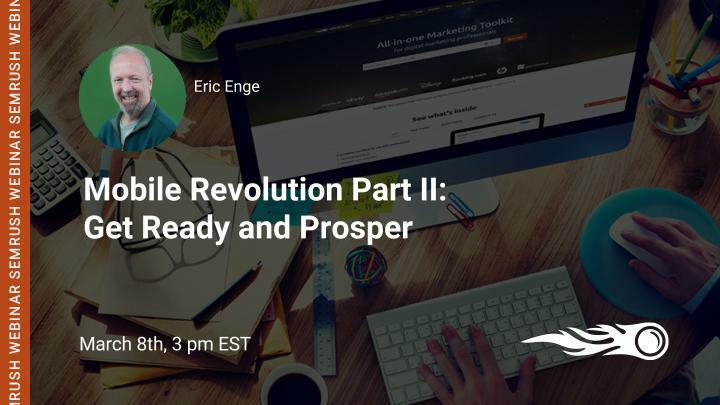 Come to this webinar for a no holds barred discussion about what’s coming, and practical tips on how to position yourself for success today. If you're interested in learning more about mobile strategy, Stone Temple Consulting will be hosting NEXT10X on April 5 from 8AM-6PM in Boston. Use code SEMRUSH2017 for a $200 discount.